After sharing my experiences decorating floats with my daughter, I figured it would only make sense to actually show her. The entire family packed into the car for a quick trip to the float near us in the City of South Pasadena, the oldest self-built float in the parade. 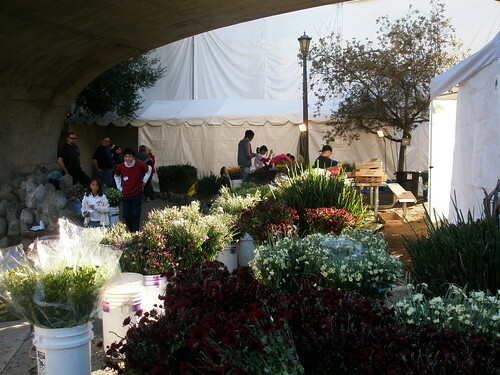 Located behind the War Memorial on Fair Oaks, the group of long-time volunteers and South Pasadena High School students pitched in on their entry into the 2009 Tournament of Roses. 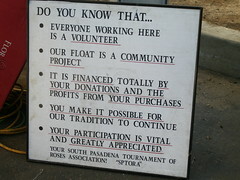 Since the entire float is raised up through volunteer efforts, the committee has several ways for locals to donate money. Last night was their Crunch Time Dinner, a sort of last minute shove to get bills from this year paid off and ramp up for next year’s float. Another little way to raise money was to give us the opportunity to get our name on the float, so to speak. For $1, we signed a vial that will hold flowers that will be placed on the float. Walking in, we came upon a group of women who were deveining luminaria. I spoke to one who has been volunteering for 15 years and another, Wendy Snow, who has volunteered for the last 27 years and is now on the float’s committeee. My daughter, fascinated by the project, quickly jumped in to help them and you can too. 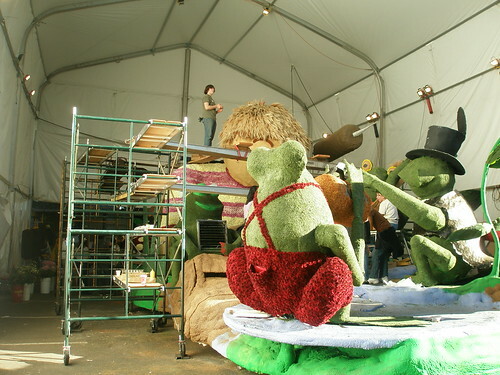 There is still a few more hours to decorate before the float gets towed to Orange Grove Blvd. If you’re in the area and want to experience the fun or just drop by to make a donation, they’d love to have you. You can view more photos in my flickr set. Hey! That’s only about two blocks away. I may have to walk over there this afternoon and see if I can help out for a bit. Fun! 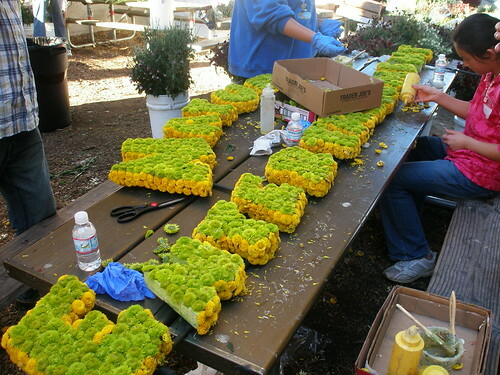 I was finally able to volunteer this year to help decorate the Downey Rose Float Association’s entry for this year’s parade. I have wanted to do this for ages but work was always in the way. I actually pulled an all-nighter with the builders last night, which was rough but very satisfying. I loved knowing that I was a part of this year’s float as I watched it being towed from Downey to Pasadena tonight. We had a lot of volunteers show up that had no ties to Downey, but wanted to help with a float if they could. It was a great time for everyone. I’m going to join the DRFA this year and try to keep doing it for as long as I can.